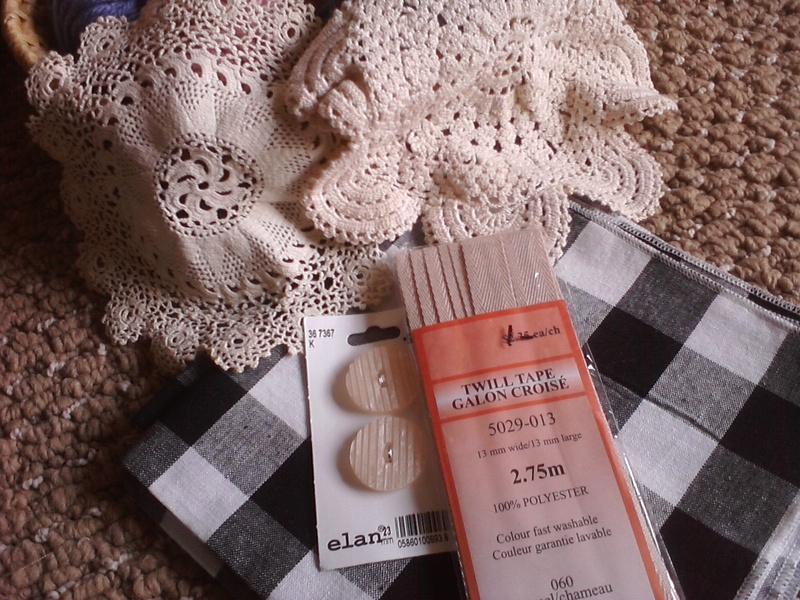 Doll's Musings: Finishes, Thrifting and Crochet!!! I love shopping there! I get to bargain with the lady which I find so much fun!! 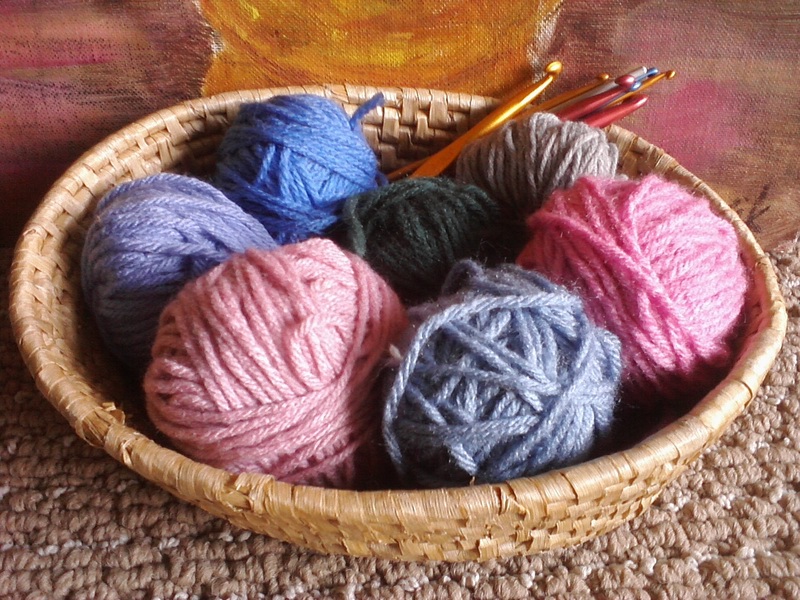 She told me that the 8 crochet needles I bought were worth about $1.00 each. I got the whole lot for 50 cents!! Fabulous!! Here's some photos of my finds. Titus wouldn't sit still for the picture. 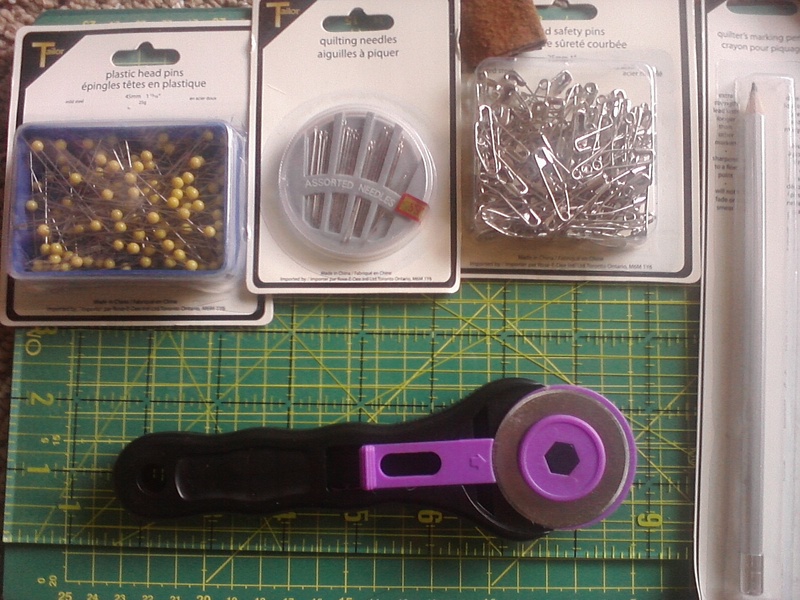 After my thrift store scores, I headed to Fabricland and found a quilter's beginner kit for half off! I got the whole kit and kaboodle for $25!! Usually, just the rotary cutters cost $25.00 on their own. So I think I got an amazing deal!! See, I'm on a roll!!! Onto the finishes. I finally completed my Mom's ornament. Yup, finished it in May. I don't know why it took me so long to finish it. I made my own twisted cord the old school way: taped to my desk and with a pencil. I used a tutorial to make the twisted cord. I think it looks really good. I'm sure my Mom will love it!! 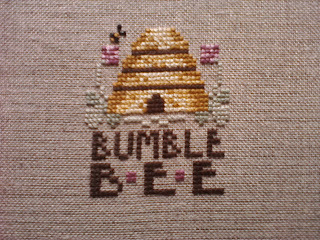 On Thursday night, I began stitching the chart I won from Rahenna: Sisters and Best Friends "Bumble Bee." 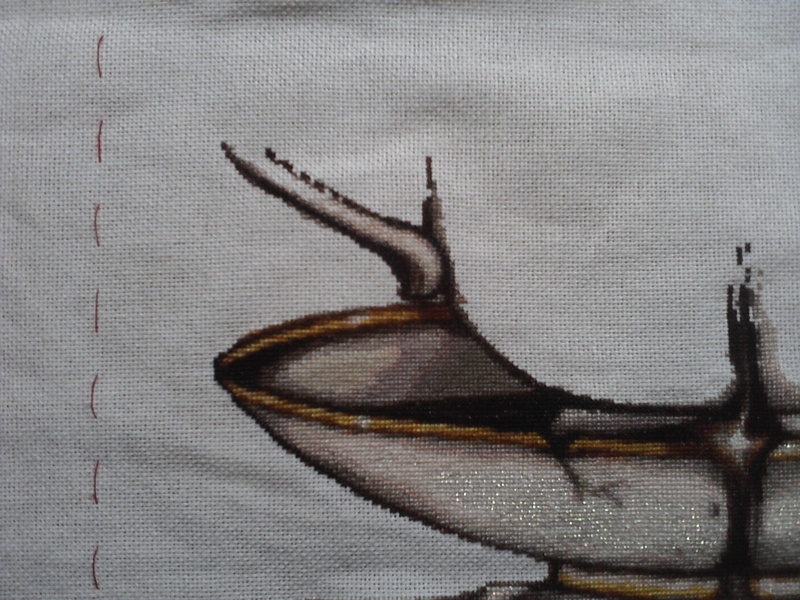 I stitched it on 32 ct. Natural linen using DMC threads. I had this cute little frame that worked perfectly with the pattern. I love bees!!!! I think this was my fastest finish to date. If only all of my finishes could be made that quickly!!! 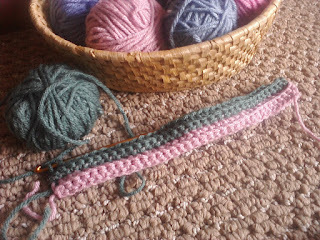 I also started two new projects. One is a secret and so I can't show anyone what I'm doing. The other is nearly completed. I just need to buy new glue and then I can finish it. 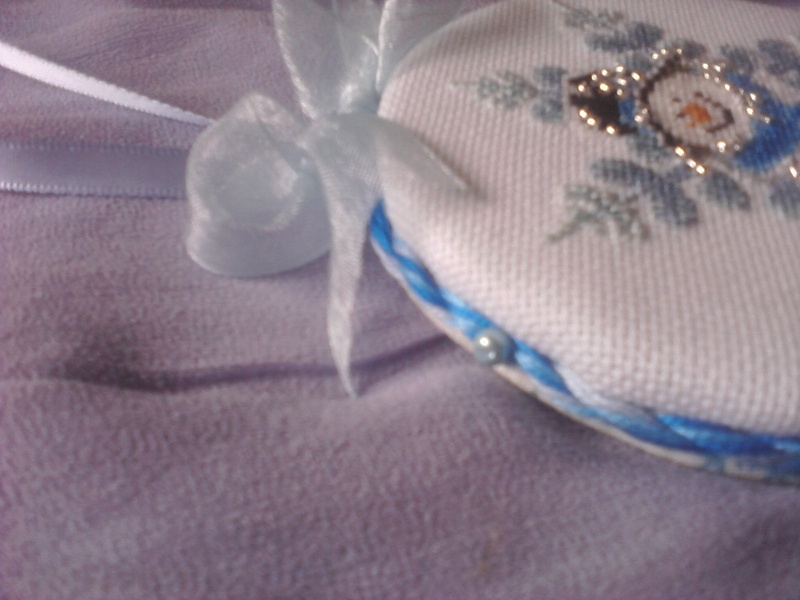 There are also a number of little projects I want to start from the Gift of Stitching. I ended up buying more of the magazines and have been loving reading all the articles and looking at the designs. Tons of great ideas and projects to do!! A note on giveaways. I recently won Topcho's giveaway!!! I am so excited to receive her adorable needlebook that she made! Thank you so much Topcho!! I'll be eagerly awaiting my package!!! 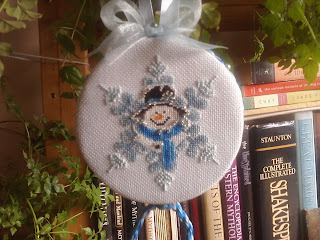 As for my giveaway, I'm still mulling over what to make. I want it to be a handmade item but haven't picked out the pattern yet. Stay tuned!!!! I stitched more of the tea cup handle on TBF. No Jane stitching though. I've been too eager to get my other projects done that I figured I will stitch on her when I don't feel like finishing!!! After I took the first photo of TBF, Titus rolled in!! Luckily, he is very gentle and didn't do anything to my stitching!!! Well, I hope you enjoyed this post. I'm very happy to have actually completed a couple of projects and hope to have a few more to share with all of you soon!! Looks like you had a nice shopping trip. Bargains are good! The ornament came out great and your other WIP projects are looking great. I've been meaning to start crocheting again but I just haven't found any time! The snowman ornie is cute too. 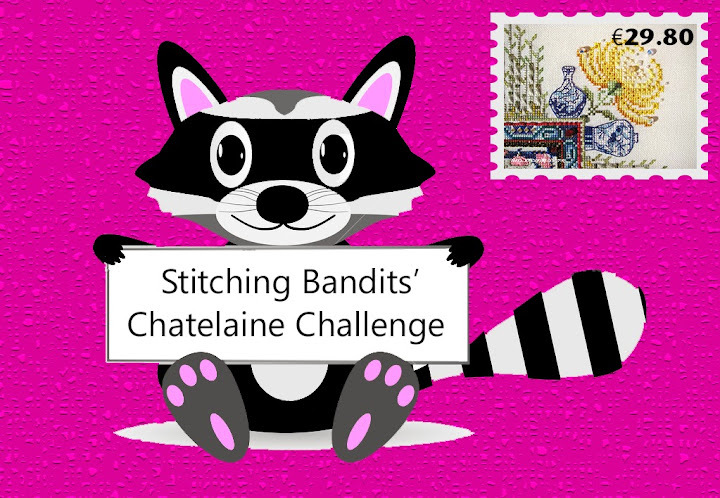 I'm really looking forward to seeing what you choose to stitch first from GoS. It's so hard to decide isn't it? Awww, Titus is such a cutie! 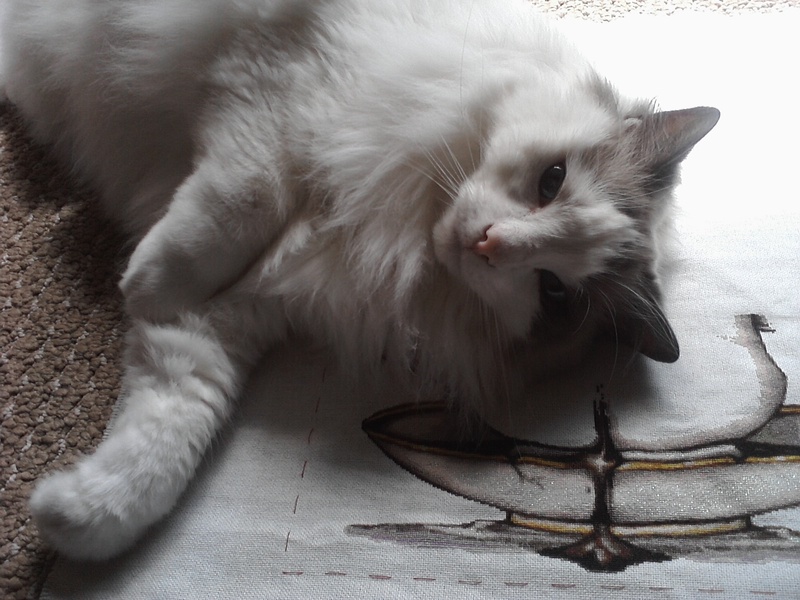 He sounds like Mia -- doesn't ever harm my stitching or my fibers. Now if I kept my fibers out of their floss away bags, it might be a different story on that, but. lol! Great deals you found, both on the crochet and the quilting starter kit! Be careful with the rotary cutter -- I still shudder when I think of how I cut my finger once. Ugh! 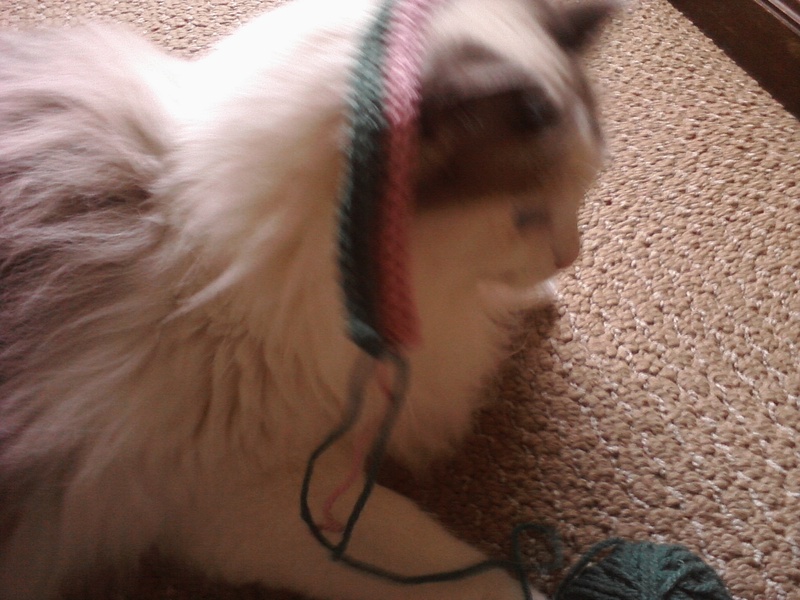 Good for you with the crochet too! Love your mom's ornie -- so pretty and nicely finished! Love the bee finish too! I love your snowman ornament! It's really cute, congrats on a beautiful finish! 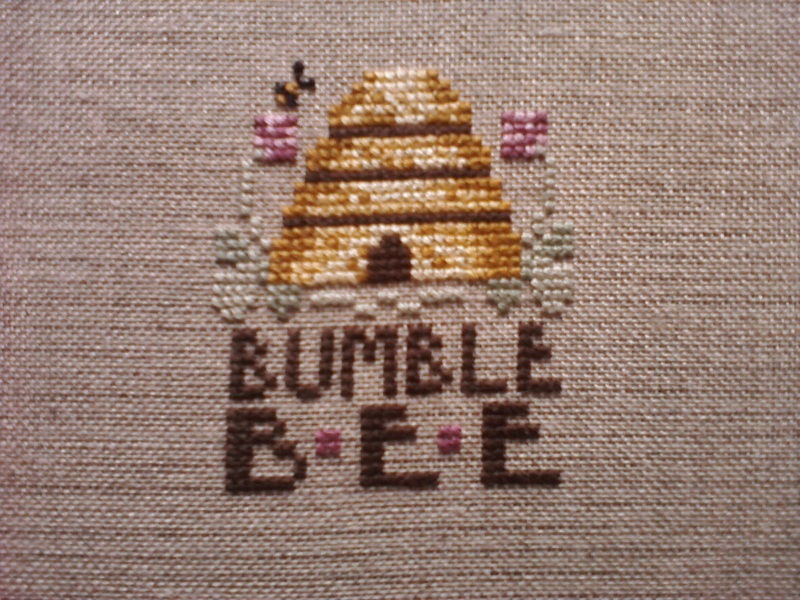 The bee design is very pretty also, and it's nice to see some progress on TBF! So you had a visit from the finishing fairy too!!! 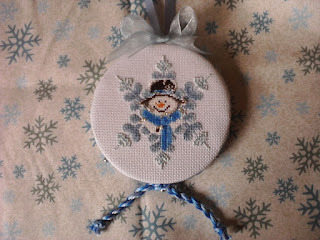 Your snowman ornament turned out wonderfully! And didn't you get some great bargains! Love your mothers ornament how cute . also love your Bee one . Hugs. I see that you have enjoyed yourself very much! nice needlework, i love to crochet! Lovely stitching and great bargains! I love the snowman ornament you've made for your mum, the twisted cord looks great. Have a lovely and relaxing Sunday, my friend! I'll be in the car most of the day driving back home... No stitching time for me! It is very nice shopping! I love the colors and that tea cozy is pretty amazing. Aren't super models difficult to deal with? Titus is so beautiful. Your Mom's ornament is beautiful. It is such a sweet design. Great finish on the Bee chart too. You are getting so much done right now! I think Titus is liking that camera more and more! lol. What a handsome boy he is! Great thrifting finds and buys at Fabricland! I see you have the thrifting bug. I want to learn to crochet too! Your stitchy finishes are great. I'm sure your mom will love what you made for her. Isn't the sunshine wonderful? We were out in the garden yesterday and will be again today! Lots of work out there to do! Thrift store finds are so awesome!! I have one where I actually have to limit myself, ahaha~ The ornament looks great and now it can be a Mother's Day surprise!? And I think Titus wanted attention and loves. "Stop taking pictures and loves meee~"
You've certainly done a great job with the cord. Thanx for the link. Will check it out. Cute Bumble Bee finish. The frame's just lovely. Amazing, Anne! You have been a busy bee, haven't you! You got so much done and you should be proud of yourself! Titus is so gorgeous! Beautiful finishes Anne! 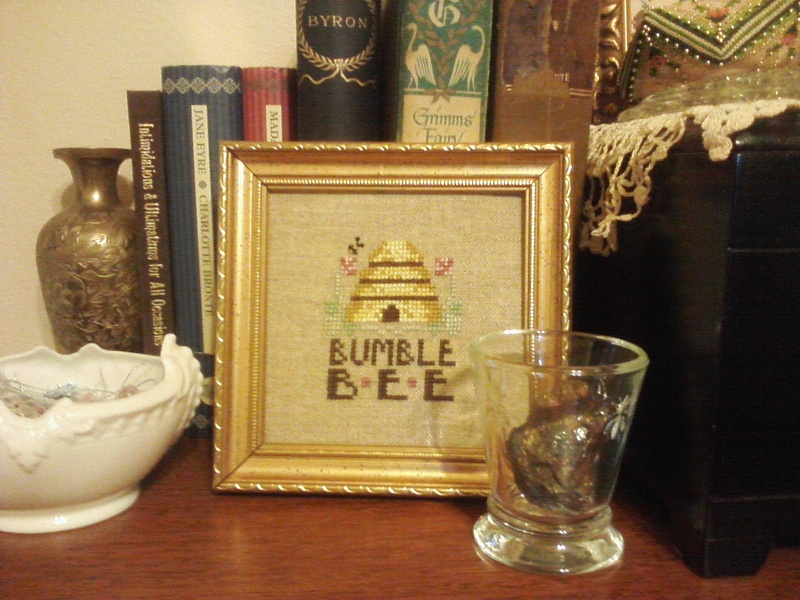 The frame for the bumble bee design is perfect! Thanks for stopping by my blog now I get to see yours :) just love your bargains but your Bee project is just adorable! have a happy week. You got some GREAT bargains! I love thrift shopping. So fun! Cute finishes!! And great thrifting/shopping deals. Kudos! You did a gorgeous job on your Mom's ornament!!!! You found some great bargains! I'm never so fortunate and I'm convinced that everyone has better thrift stores than we do here. Your mothers ornament is finished beautifully! that was some good shopping you got done there and a couple of cute little finishes as well - good going! Congratulations upon your wonderful finishing and your great newest finds too! Your Mom is sure to love the adorable ornament, and your twisted cord looks perfect! Titus, in the middle of everthing is absolutely fluffy and cute as ever. ANNIIIIIIIEEEEEEE, your mom's ornie is DARLING!!!!! Awwww... I love it. Great finishes! I hope your finishing bug will hop all over the ocean to reach me!